This is the MiniArt SU-85 Early Production. I built this mostly OOB with some scratch. This is my first MiniArt kit. Here are my build notes and impressions. All the brass color photoetch is included with the kit. The plastic is softer than anything I've worked with before. It takes Tamiya and Gunze liquid cement just fine. Overall the kit has some really nice details. Parts are crisp, and detail is sharp for the most part. There is some flash on the inside faces of the thru hole in the road wheels that will need to be cleaned up. The part break down for the running gear is a little overly complicated. I'm fine with extra parts, it's better to have more than less, but the number of parts for the road wheel arms will create opportunities for misalignment of the road wheels. The tracks are very well done. The sprue attachment points could have been smaller but clean up is fine. The tracks click together and are workable. But be very gentle. The tiny pins used to hold the track together want to sheer off. I've ruined about 10-15 and had to resort to drilling out a few and using resin bins to hold a few together. The alignment pins for the road wheel halves are ridiculously small. They are the size of in-scale bolts. The wheel assemblies are engineered to spin freely. Again, this makes for some overly complex assemblies. The idler wheel mount post is too loose in the socket. I wrapped the post with .010" styrene strip and sanded down until it was a firm fit. Don't glue the idler wheel assembly until the track tension is adjusted. They only supply you with enough PE for two fuel tank tie down locations which is odd. The ends need to be rolled over and form a loop but no indication marks are provided on the PE so I had to guess. I thinned the front and rear fenders with a burr in a motor tool and banged them up with needle nose pliers. I replaced all the tie down loops with formed brass rod. The kit ones are a combination of flat PE and styrene with beefy sprue points. I annealed the brass rod with a torch first so it was easier to form. I still need to add the welds for these. The kit hand holds are very fragile and have a multitude of sprue points. Too many to trim or clean up without breaking the fine rod. I trimmed out the rod and replaced with brass rod. The air exhaust screen is nicely done in two pieces. The mesh sits in a molded recess and the frame fits over top. I soldered the two together first and then had difficulty getting the parts to align in the plastic recess. The kit tow cables are molded styrene. I trimmed off the eyelets, drilled out the ends, and inserted some hand made copper wire "cable". I used some Aber soviet tool clamps for the empty shovel bracket. I used a few extra road wheels from my spares bin based on war-time photos. Incredible detail! Nicely done Bryan! Looking forward to seeing this in paint. Awesome work, I love the unpainted look, it shows all the effort put into the work. Thanks Dennis. Yes, this is a very solid kit OOB. 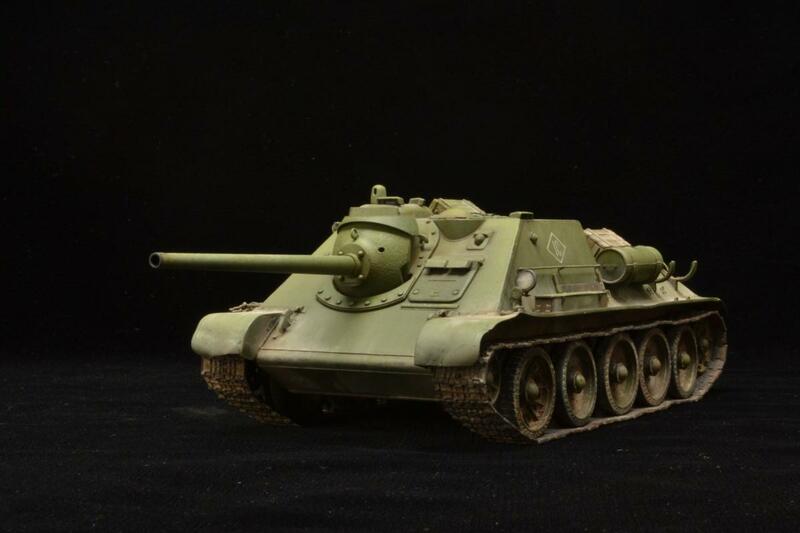 I kinda want their Su-122 now but might wait and see if they release a SU-100. Airbrushed with Tamiya. Chipping and rust was done with Valleo Acrylics with a tiny brush and torn bit of foam. Dot filter applied with oils and blended with Turpenoid. Sorry for the poor quality images. Taken with phone. Will try with legit camera next time. Very well done! I like it! Further filters, washes, and oil paints. And it's done. I wanted a rather dusty appearance so most of the upper surface effects are made with pigments applied dry then set with thinner, fixer, or just scrubbing it in. Sensational job man. Your weathering is just perfect. I am so impressed with the quality of your models as they are photographed against the black background. Please step back and take a picture of your photo setup so we can learn to improve our own efforts. 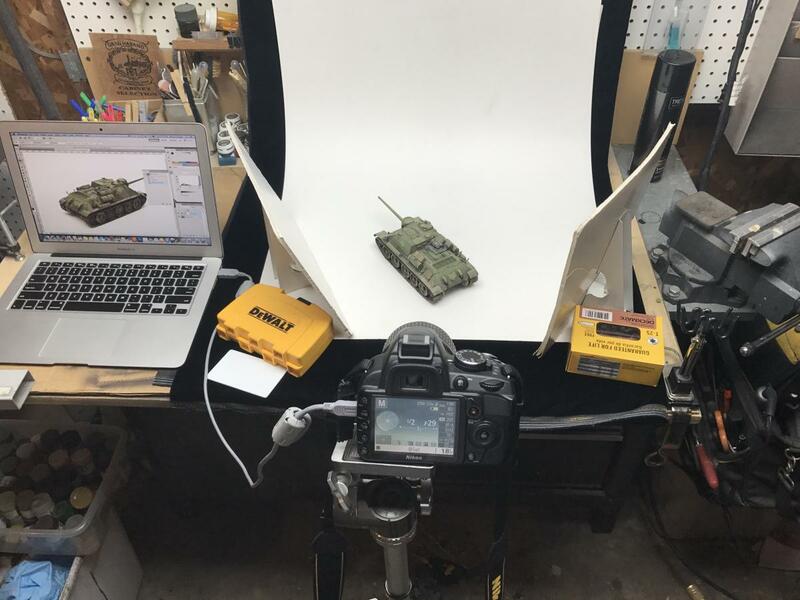 It is so helpful to see model photos that are not made against the background clutter on a workbench mat. Thanks. This is where all the magic happens! The lighting is a bank of 6 fluorescent shop lights. Two white cards bounce the lighting to cut down harsh shadows. I took a few photos on white paper board but decided to use the black velvet for the final shots. A bit of work is done in Photoshop to adjust the white balance and levels and clean up any of the backdrop so it is a rich black with no shadows or highlights from the velvet . I don't always have the laptop hooked up to the camera but did this time. Here is an unaltered image from the shoot.